Putin@war: A staged deadly provocation by Russia(n Media) in Slovyansk. A staged deadly provocation by Russia(n Media) in Slovyansk. On the 20th of April it was reported that the Right Sector had tried to attack the people of Slovyansk. 3 locals were killed when two cars drove to a blockpost with unarmed seperatists and opened fire. When help arrived, they shot some of the attackers and burned their cars. 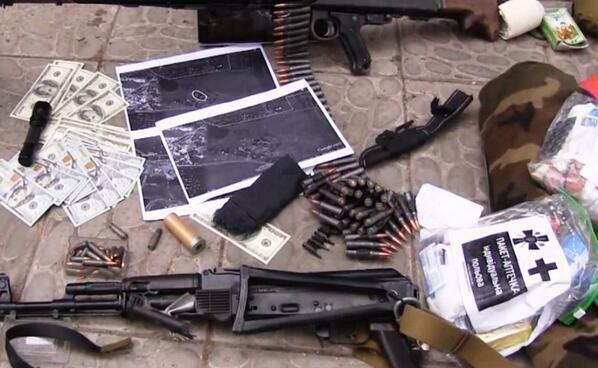 Dollars, bullets, a machinegun, maps and a businesscard of Yarosh, the Right Sector leader. This was proof that the town was under siege and needed to be defended! Russia Today was the first to report about this. There are numerous serious flaws with this story and therefore it was argued it was staged. One interesting thing is that the upload date of the video shows on the 19th of April. TT @KodeksuNET: Life News video about #Sloviansk shooting was published on 04/19 !!! http://t.co/DThEyy88kR http://t.co/RiCqCnmkrE"
The video can still be found here: https://www.youtube.com/watch?v=EDhCIquWa-Y with the supposedly wrong date. But this is due to the fact that this date is calculated based on the time of the servers in California, which has 10 hours time-difference. Why would Russia(n Media) stage such a deadly event that costed at least one live of local people? Well... to convince the city of Slovyansk that they were under attack, needed protection and needed to defend themselves against some big Right Sector Evil. Why were the locals in the beginning so angry and eager to stop tanks? Because they were really convinced the Nazis were coming again. That... was the purpose of this crime.